Ooh here is a lovely treat! 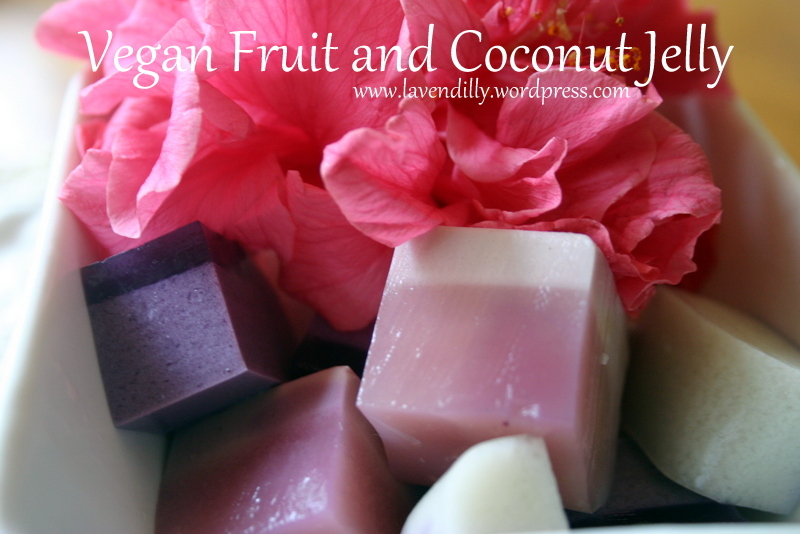 I’ve been having fun with jelly again, making little fruity gummy treats for the children with gelatin. I was so excited about how easy, fun and yummy these are that I wanted to share them with playgroup, however at playgroup we eat vegan … so switch gelatin for agar and honey for maple syrup. Remember the Rainbow Fruit Jelly Cake? These are just as easy to make, and just as lovely to look at. 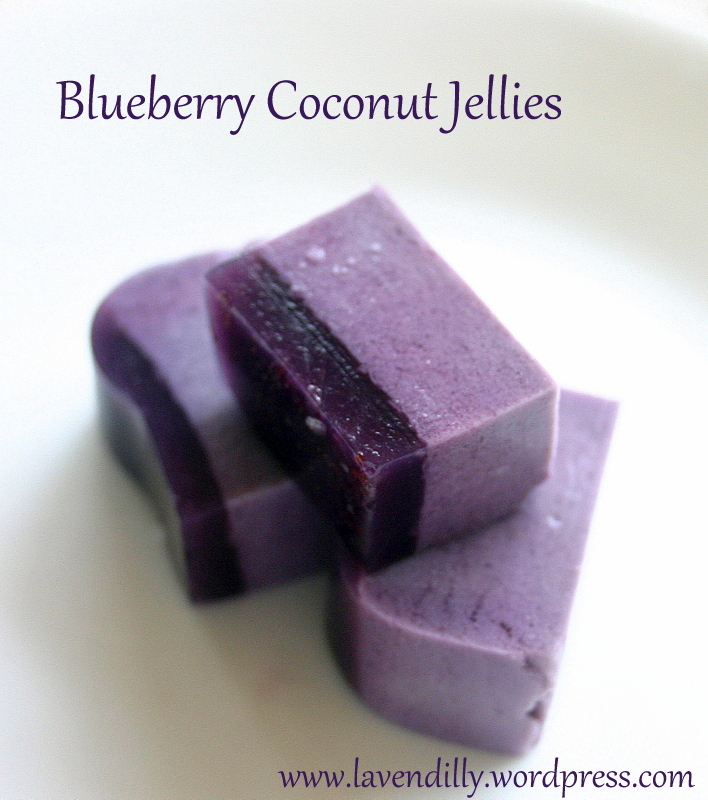 These little vegan jellies are a softer, lighter, more refreshing experience than the fruity gummies I made with gelatin. They are so pretty and so delicate, they’d be perfect for a light, refreshing, sweet treat after lunch. Today I served it with the fruit at playgroup morning tea, and we followed it up with raw pumpkin pie. Except for my really chewy sour dough bread rolls (win some, lose some!) it was a pretty delicious morning at playgroup today. I think these jellies are magic. The coconut cream floats to the top as the jelly sets so you get this lovely separation of colour, with the clear jelly underneath. The light pink ones pictured were made with rosella fruit, cooked until the colour faded on the fruit, and then strained out at the end. 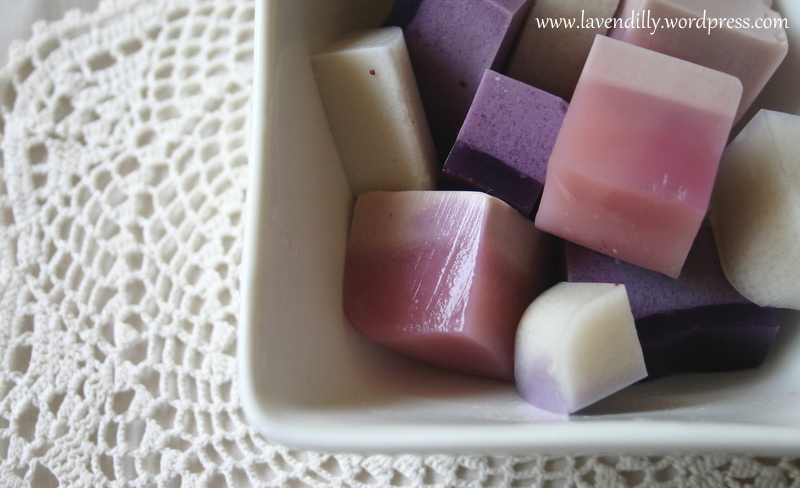 The beautiful purple ones are made with blueberries and the white ones have a splash of vanilla essence instead of fruit. In a saucepan, pour in water, coconut cream and maple syrup. Whisk in the agar agar powder and let sit for 5 minutes, then add fruit and bring to the boil, stirring constantly. Turn down the heat and simmer, whisking gently all the while, for about 15 minutes. Gently press the fruit while stirring to release the colour, essence and juice. Pour through a sieve into a flat container with a lid and place in the fridge until it sets firm. The coconut cream should rise to the top, leaving a translucent layer underneath. The colour of the fruit juice will be more intense in the bottom layer. The rosellas made a pretty pink jelly, blueberries made a vivid purple and to make white jelly leave the fruit out altogether and just add a little vanilla essence.